Dr Nikolaos Karydis, Lecturer in Architecture, will present his work on ‘Basilica B at Philippi and the Development of Vaulted Architecture in Early Byzantine Greece’ at the 46th Symposium of Byzantine Studies ‘Byzantine Greece: Microcosm or Empire?’, which, this year, is organised by the University of Birmingham. Dr Karydis’ lecture will take place at the Arts Building of Edgbaston Campus, University of Birmingham on Sunday 24 March, at 9:15am. Prof. André Potvin and Prof. Claude MH Demers of Laval University, Canada will be hosting research seminars for the Kent School of Architecture on Wednesday, 20th March at 2pm, in GS5, Grimmond Building. Urban microclimates are complex phenomena that are seldom tackled at architecture level. However, early decisions in the building morphology can have major impacts on the pedestrians’ thermal comfort at street level. I will draw a portrait of my early interest in urban microclimates prediction methodologies from a purely thermal comfort perspective leading to our current interdisciplinary research project on Urban Heat Island mitigation in Nordic cities. 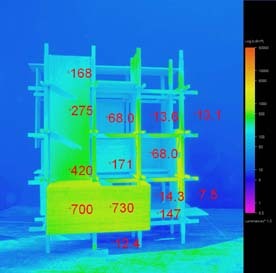 This project has highlighted the complexity for building professionals to understand the time dependent UHI effect and the lack in effective tools to tackle the interrelated microclimatic dimension in early design stages. André Potvin completed his PhD at the Martin Centre for Architectural and Urban Studies, University of Cambridge. He cofounded the Groupe de recherche en ambiances physiques (GRAP) dedicated in passive environmental control strategies at the urban, architectural and detail scales. His most recent research and consultancy work include bioclimatic architecture, urban microclimatology and environmental adaptability. He is currently involved with two important funded research projects on Nordic Cities Adaptation to Climate Change and Adaptive Architecture. Dr Potvin is also a keen collaborator with private practice through Integrated Design Process (IDP) design charettes in several institutional and academic built projects. He is member of the Canadian Green Building Council (CaGBC), associate member of the Centre de recherche en aménagement et développement (CRAD) and the Institut environnement, développement et société (EDS) as well as a member of the steering committee for the newly launched Centre de formation en développement durable (CFDD) at Laval University. Architecture is associated with increased levels of complexity and technical knowledge, but this should not imply the lack of intuitive inspiration. Tactile experiences favor an explicit knowledge of the importance of space, matter and the location of opacity in relation to daylight. The qualitative and quantitative evaluation of daylighting design intentions should be at the forefront of creative thinking in architecture and environmental design. Analysing images obtained from actual spaces and physical models in relation to the latest digital technologies can reinforce the interpretation of daylighting design and performance of a spatial configuration at the speculative stage of composition. This presentation focuses on a design methodology based on image analysis and tactile manipulations using digital and analogical techniques applied to actual architectural projects. Dr Demers completed her PhD in architecture at the Martin Centre for Architectural and Urban Studies, University of Cambridge, innovating on the integration of qualitative and quantitative assessments of daylighting in architecture. A co-founder of the Groupe de Recherche en Ambiances Physiques (GRAP), she is actively involved in teaching and research on daylighting through funded projects. Her current research grants, “The Creative Eye: a digital process exploring visual and thermal diversity in architecture” and “Adaptative Architecture: Experiencing Visual and Thermal Delight in Adaptable Environments” with co-researcher Dr Potvin, is developing digital imaging tools of analysis. She has also been involved in research on occupant’s satisfaction, associating the importance of architectural design to user’s behavior. She is an expert in the physical modeling of light under real and artificial skies, developing and applying her research expertise to several projects. She was responsible for the implementation of daylighting strategies for buildings such as the New Canadian Embassy in Berlin, the Caisse de Dépôt et Placement (Medal, Royal Architectural Society of Canada, Technological innovation), and the Kruger Pavilion, Centre for Wood Transformation (Excellence Prize, OAQ).